Thracian Cliffs Golf & Beach Resort offers guests a luxury golfing experience unlike any other on the planet. Perched upon the striking cliffs of Bulgaria’s eastern coast, Gary Player’s masterpiece overlooks the Black Sea from every breathtaking hole. Already being heralded as a future top-3 course in the world, this is one you definitely don’t want to miss. Thracian Cliffs is found on not far from the city of Varna and less than an hour from Varna Airport. The incredible array of facilities and amenities are presented against a backdrop of breathtaking scenery and complimented by an unrivalled level of service. This all-encompassing resort offers guests a multitude of exemplary dining options and a lavish spa to name but a few of the ways to unwind after a round. 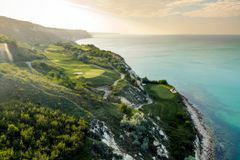 The setting for the 18 hole golf course at the Thracian Cliffs Resort is truly stunning and rivals that of any other course in the world. A multitude of tee positions allow the Gary Player designed course to be sampled be golfers of all standards and everyone who tackles this picturesque course will be sure to be inspired by the dramatic coastal surroundings. The golfing experience can be further improved by hiring one of the professional caddies who will ensure their player for the day gets the most out of the course no matter the condition. In May 2013 the course hosted the crop of professional golf as the venue of the Volvo World Match Play Championship. The tournament was eventually won by Northern Ireland star Graeme McDowell who beat Thongchai Jaidee 2 and 1 in the final. McDowell triumphed against a stellar field including Henrik Stenson and Ian Poulter, while former US Open champion Geoff Ogilvy commented "It’s a stunning bit of land. I don’t know if I’ve been in a place as impressive – a bit like Torrey Pines." With Thracian Cliffs receiving critical acclaim for its design and layout it is quickly becoming a must play destination for golfers. Accommodation is divided between two tranquil village settings that sit on opposite sides of a picturesque lake, both of which offer stunning panoramic views of the surrounding landscape and the Black Sea. The Marina Village is perched atop the cliffs and offers a selection of 64 suites and a beautiful piazza that is adorned with top class restaurants, bars and boutiques. The Hillside Village overlooks the Black Sea and boasts 87 lavish suites that surround three peaceful infinity pools. All of the suites at Thracian Cliffs Resort are adorned with ample amenities including air conditioning, Wi-Fi, 24 hour reception and a convenient baby-sitting service. Guests are well catered for by the collection of top class restaurants including the main restaurant at the Marina Village that serves up delicious Bulgarian and Provencal classics.Guests can also enjoy a less formal meal at the Club House as well as takeaways and prepared picnic hampers from the Deli. The Spa provides the perfect place for guests to pamper themselves with an impressive range of treatments or to unwind after a day on the fairways. This amazing golf resort is located around an hour from Varna which is serviced with direct flights from both London Luton and Manchester. Those wishing to travel from Heathrow, Gatwick, Birmingham or Edinburgh can get indirect flights.